Last time out, we learnt how a simple waiver clause can protect your business from unwarranted liabilities. In case you missed it kindly follow #LegalBusiness to get updated. BeWise Digital Limited had only recently started engaging with some major international partners and Becky had come to realise that she needed a website to properly portray her corporate image to the world. She was scheduled to speak at an international conference in 6 weeks and needed her website to be up and running before then. Becky quickly enlisted the help of a freelancer website developer named Tunde who promised to deliver the website within 2 weeks. They agreed that she would pay half of the money before he starts and the other half after he delivers. These agreements were all made orally, no written contract was signed. After two weeks, she called Tunde to ask if the site was ready and he said he was experiencing some technical issues and would get back to her. Another two weeks went by and still the website was still not ready. Tunde had started to ignore her calls. She had no idea of where she could locate him as he had no office and all she had was his phone number. Becky was furious. The unsavory prospect of speaking and networking at the international conference without a proper online presence to boost her company’s profile stared her in the face. She frantically started looking for another web developer and was introduced to Linus who agreed to take on the job. Linus worked day and night and delivered the website in 10 days… just a few days to the start of the conference. Becky was relieved. It had been a close shave. 5 weeks after the conference, she got an email from Tunde the missing web developer saying, “website completed and ready for demo. How soon can you make payment of balance?” Becky couldn’t believe her eyes. She replied him in some choice words that he was lucky she had not gotten him arrested for defrauding her of her initial deposit. She told him she had given the job to someone else who had delivered her website to her. Tunde was shocked and asked why she did not communicate to him that he should stop work on the site. He went on to tell her how he had spent his time and resources to finish and host the site and demanded to be paid his balance. A week later Becky got a letter from Tunde’s lawyer threatening legal action. Becky consulted her own lawyer… ready to fight it out. He asked her what her contract with Tunde stated in relation to delivery timeframe of the website and she responded that there was no written contract. All they had was an oral agreement. Her lawyer was disappointed. He had warned her several times against having oral agreements with her stakeholders. He advised her to allow him negotiate with Tunde to pay a reduced percentage of the balance because if the matter was to go to court, her chances of winning would be low since she did not communicate to Tunde that she was no longer in need of his services, and she had promised to pay up after delivery of the site. Becky reluctantly agreed and ended up paying 85% of the amount for a website she was never going to use. She was furious with herself for making this mistake. Are you like Becky, do you make oral agreement with your stakeholders? Do you choose to work with people without having proper contracts documented showing critical clauses and contact addresses? Then you need to rethink your choices. 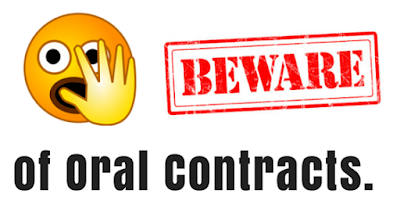 A simple agreement containing the necessary clauses like the time frame for the job, the terms of the contract, the instances that would lead to termination of the contract and so on would have saved Becky from wasting money on a website she didn’t need. As professionals and entrepreneurs we need to ensure we get our lawyers to put proper contracts in place to govern all engagements with our key stakeholders. Where contracts are presented to us for execution, always give it to your lawyer to go through it to make sure the terms stated therein are favorable to your business. You know how we roll, hit me up in the comments section and let’s know your thoughts. One more thing….. you are AWESOME!